In a previous article, we talked about the issue of “too many pushes”. In a team with more than a dozen or so members, people often end up racing with each other to push their changes to master or another shared branch. This results in wasted time, frustration, and reduced code quality since people can’t take the time to fully validate their changes out of fear of losing the race. In this article we’ll look at the details of why this race exists, and how we’ve solved the issue for Git repos hosted on Azure DevOps. A small bit of background: Git history forms a directed acyclic graph (DAG), in which every commit has to reference a previous set of one or more parent commits. When you fetch or push, part of what’s being transferred between client and server is this DAG, and it is very important to preserve the shape of the DAG in a reliable way. And as we discussed previously, branches are pointers to commits in this DAG. That last step, advancing the server’s branch pointer, is where the race comes in. In theory, moving a pointer from one commit to another is no big deal. However, part of the server’s job is to ensure that everyone’s changes are preserved, and that one person’s push doesn’t cause another person’s changes to get lost. If the server allowed anyone to move the branch pointer from any commit to any other, it would be all too easy to lose other people’s work. Let’s examine why that is. Commit B still technically exists, but it’s no longer reachable from master, or any other branch. 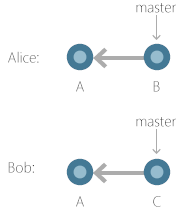 And more importantly, Bob did not consider Alice’s changes when constructing commit C, so commit B is effectively lost unless Alice comes back and re-merges B into master. To prevent this from happening, Git’s default behavior is that a push must result in a fast-forward on the server. What this means is that the update from the branch’s old commit to its new commit must follow a linear path forward through the DAG. 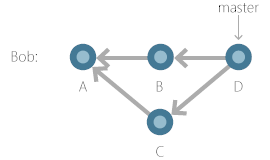 In the example above, Alice’s push resulted in a fast-forward, because there is a path forward from A to B. However, Bob’s push would be blocked, because there is no path that gets from B to C, without having to move backward through the DAG. Side note: Git allows you to override this behavior with a force push. However, Azure DevOps and many other services allow you to configure the repo to block force pushes to important branches like master. It’s generally a good idea to prevent arbitrary pushes to shared branches. In either case, Bob can now push to the server, because the server will have a path available from either B to D, or B to C’. That is, Bob can now push, as long as no one else succeeded in pushing during the window between Bob’s most recent fetch and push. To restate all of the above in English: you can only push to a branch on the server if your new commits are based on the latest commit in that branch on the server. So if anyone else pushes to that branch, you won’t be able to push without first incorporating their changes. When your push gets blocked, the fix is easy enough: just fetch, rebase or merge your commits on the latest, and push again. On a small enough team, that’s the end of the story. However, the more people there are on a team, the more likely it is that any one person is trying to push at a given time, until you hit a tipping point. Past that point, so many people are in the fetch/merge/push cycle that you may never be able to complete yours fast enough and this can result in a never-ending spiral of fetch/merge/push/start over. When the Azure DevOps repo first moved to Git, this was one of our biggest productivity killers. Developers would routinely get stuck in this race, unable to make progress because 400+ other people were working as fast as they could on their own work, preventing any of them from being able to push easily. The only way to get a change in would be to skip all validation – fetch, merge or rebase, and just push and hope, because any time spent validating the final commit would likely mean that your work was wasted. We knew that the Windows repo, with its 4000 people, would have no hope if we didn’t fix this before they came onboard. The solution is to have the server handle the race, so devs are not reduced to staring at their screen and repeatedly clicking buttons until their changes get through. A dev pushes commit X to the server’s master branch, but the server’s master branch actually gets updated with commit Y. If the dev remembers to immediately pull, they can get the real commit back from the server, but if they forget, then their next commit will be based on a stale commit. The merge can fail, because of conflicts that can’t be auto-resolved. That means that sometimes your push will fail because of a merge conflict on the server. Performing the merge synchronously as part of the push could be very bad for performance. However, performing the merge asynchronously would make both of the previous points even more painful and would make it so devs never really know the state of master. Even worse, your push could “succeed” and then later be revoked because of a merge conflict, but there’s no good way for you to know that this happened. And in the end, we don’t want anyone pushing to master anyway. This race is only one issue that needs solving, but we also want to make sure that we can maintain high quality code in master, and not just allow people to push at top speed. Due to that last point, solving the race at push time isn’t really an option after all. But there was a better solution available. For code quality reasons, we already require pull requests for all changes to master. In an upcoming article, we’ll talk about pull request policies that allow us to implement things like required tests, code reviewers, and custom validation. At first glance, this may not seem all that interesting. Completing a pull request is equivalent to pushing, and suffers from the same race. However, the code that is performing that “complete pull request” action is running on the server, and it is in an ideal position to solve the race. 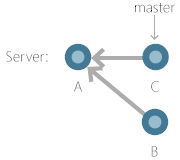 A slight detour to explain how pull requests (PR) work: when you create a PR, you specify a source branch, such as your topic branch, and a target branch, such as master. In order to show you a diff of your changes, the PR creates a merge commit at the moment that you create the PR. This merge commit is added to the DAG and a temporary ref is created that points to it, named refs/pull//merge. This merge commit is then used to render the diff, and also to run builds and other policies. This ensures that the policies are evaluated on the code that will result once you complete the PR, rather than just running on the latest of your source branch, which could be very stale. So early on, when you clicked on the complete button in a PR, the PR controller would attempt to push that same merge commit object to the target branch. However, since you typically created the merge commit and then had to wait for code review comments, builds, etc, it was almost certain that the push would fail because of the same race we’ve been discussing here. So originally we had a second button that the dev could click to recreate the merge commit, and then try again to push. And devs would have to sit there and click “create merge”, then hope that they click “complete” fast enough that their merge commit was still valid. The obvious fix here was: when a dev clicks the button to complete the PR, just assume that the merge commit that currently exists is already stale, and create a new one before pushing. Even better, sit there in a loop and keep recreating the merge commit and attempting to push, until it succeeds in performing a fast-forward push on the target branch. Of course, if there is an actual conflict on the files that you edited, the merge creation will fail and tell you to fix the conflict, but aside from that outcome, once you click the button, your changes are guaranteed to get accepted into master. 1 PR succeeds and 399 PRs fail. Return to previous step and create 399 new merge commits. Worst case, to complete 400 PRs, the server had to compute 80,200 merge commits. That is inefficient, to put it mildly. And it limits the rate at which the server can do useful work and complete the developers’ PRs. The problem here is that pushing to master is fundamentally a linear process, since every new commit has to build on the one before. So it does no good to compute merge commits in parallel, when only one of them can do anything useful. Our solution was to create a merge queue for each target branch. Now when a dev clicks the complete button, a request to complete the PR is added to the queue, and then the server processes the queue one at a time. For each request to complete a PR, it calculates a new merge commit, and if there are no merge conflicts, pushes it to the target branch. Now, to complete 400 PRs, the server has to compute 400 merge commits. You’ll notice that this solution is inherently asynchronous. However, we already discussed previously that processing pushes asynchronously would result in a bad experience for the user if they complete their PR and think it completes, and then later get informed that it actually failed becaue of a merge conflict. The trick to making this work well is to make sure that the server can process merge requests fast enough that the UX can actually remain synchronous. So the user clicks the complete button, they see a spinner for a couple of seconds, and it either succeeds, or it fails because of a merge conflict. With this approach in place, and with a bunch of optimization work on the server, the Azure DevOps repo is now able to keep up with developers trying to complete PRs into master, and this is no longer a bottleneck to our productivity. What’s more, the Windows repo is also onboard and successfully using this system. The PR service can now complete up to 400 PRs per target branch, per hour, in the Windows repo with its giant merge commits. That is a fast enough rate that users almost never see any queue build up, and their pushes always succeed unless there is an actual merge conflict. Note that 400 PRs per target branch per hour is a fast enough rate, because the 4000 devs in Windows split their work across a hierarchy of branches. We’ll talk more about this branch structure in an upcoming article.